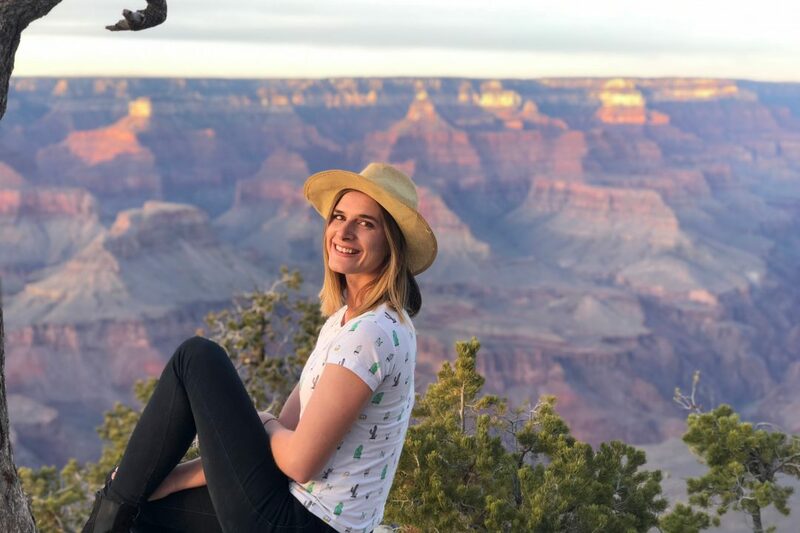 If you’re planning a trip to the Grand Canyon and want to see a few other key spots in the state, I got you covered with this Arizona itinerary. 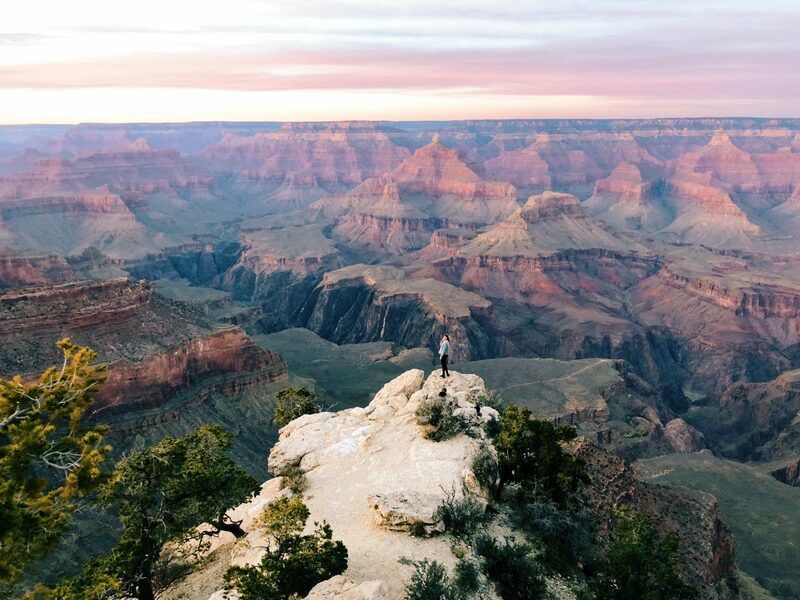 The Grand Canyon is mesmerizing and definitely worth visiting, but there are so many other spots around Arizona that will leave you speechless as well. It’s kind of just what the state has a tendency to do. 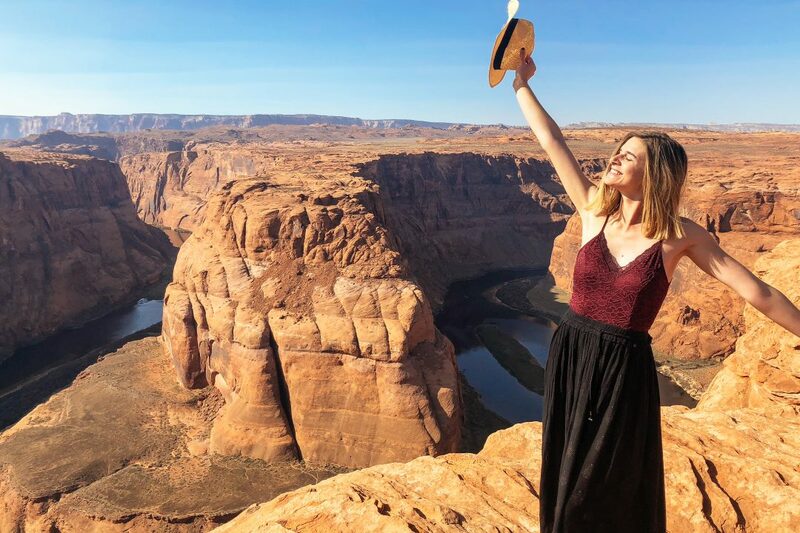 If you have slightly longer than a week in Arizona, I added in a few optional add-ons in spots like the Grand Canyon, Mesa, and Page to this Arizona trip planner, so you have a flexible itinerary that you can make just for you. If you have a week (or more) for an Arizona tour, this is what I would recommend seeing! Part of the reason why this second trip to Arizona was so magical was because I traveled around with a local Navajo tribe member, Donovan, from Detours Native America for the majority of my trip. 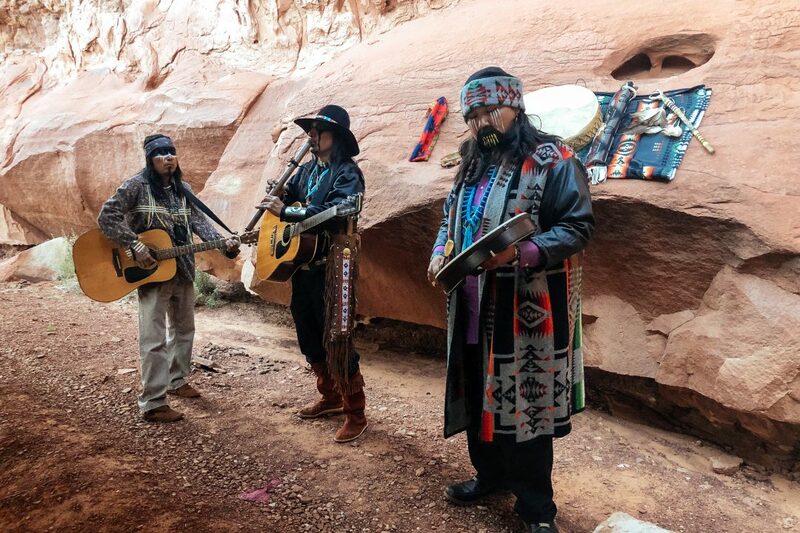 The Four Corners region in the US (a nickname for the area where Arizona, Utah, Colorado, and New Mexico meet) has a diverse and rich Native American history that is worth learning more about. 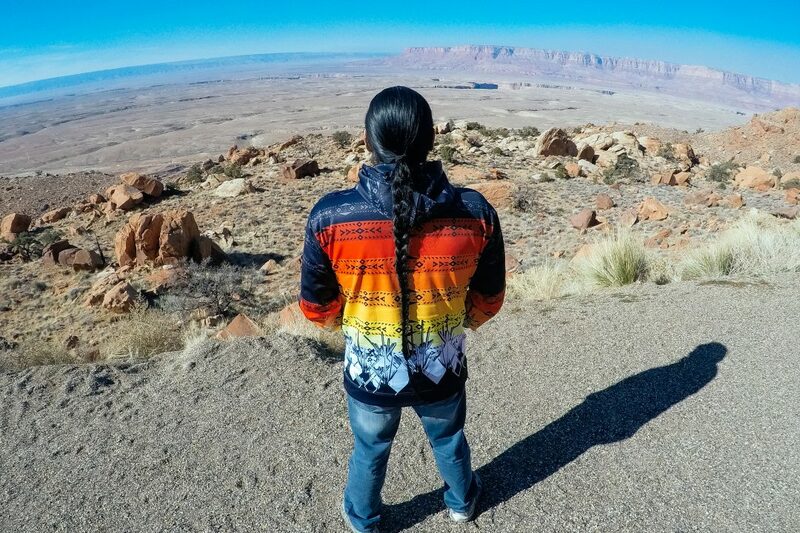 Traveling with a Navajo guide through Arizona was a great experience. 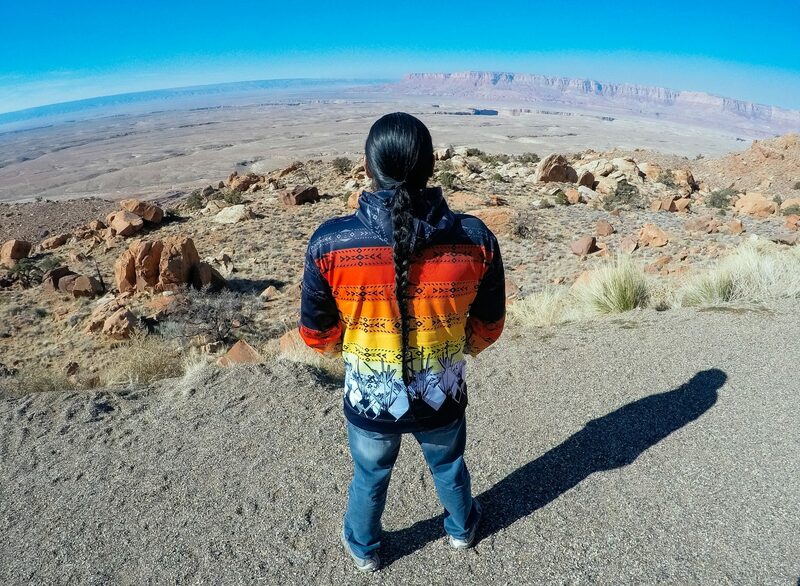 By traveling with Donovan I was able to learn more about his perspective as a Navajo and get a different history lesson in some of the most popular sights around Arizona, such as the Grand Canyon, Horseshoe Bend, Monument Valley, and Canyon de Chelly. It gave me a deeper appreciation for the places I visited, because these spots are not only stunning for photos and hikes, they also have hundreds of years of Native American history tied into them. If you’re at all interested in history or in Native American culture, I’d highly recommend contacting Detours Native America for your Arizona road trip. 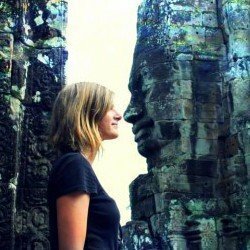 They offer private custom tours as well as group tours throughout Arizona. Welcome to Arizona! Chances are you flew into Phoenix International Airport, which is only about a 20 minute drive from Mesa. 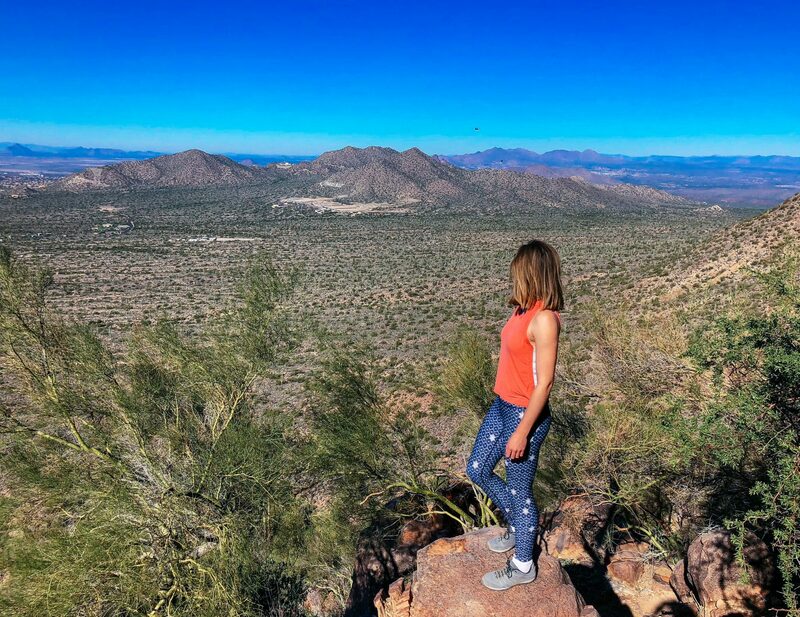 You could stay in Phoenix for your first night, but if you’re a nature lover at all (which you better be if you’re traveling to Arizona), I’d recommend staying outside the city near the beautiful Superstition Mountains your first night in the state. 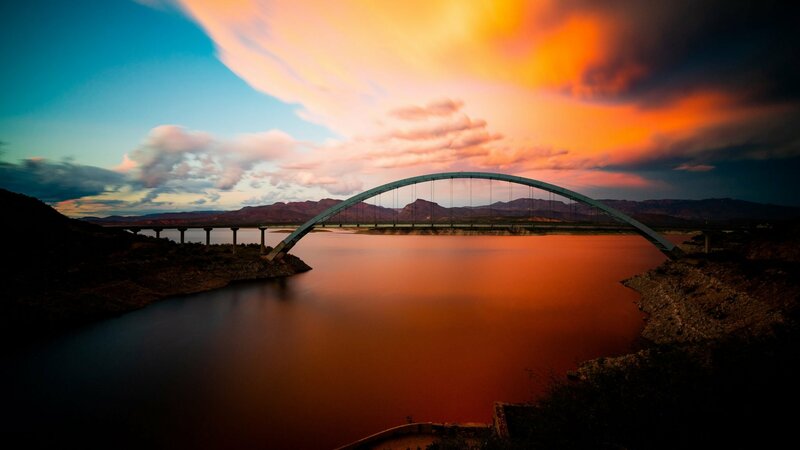 Mesa is situated perfectly in the middle of Phoenix and the Tonto National Forest, so it’s an ideal jumping off point for a number of activities, no matter what type of travel experience you’re looking for. Check out a few Western-themed spots – If you want to experience unique Wild West vibes, especially if you’ve never experienced a ghost town before, Goldfield should be your first stop just outside of Mesa. It was a bustling town in the 1890s and had residents until 1926 before becoming a ghost town. Tortilla Flat is a little further into the Tonto National Forest from Goldfield. It’s a small unincorporated community that has been an important stagecoach stop along the Apache Trail since 1904. You can sit atop saddles at a bar, drink sarsaparilla, admire the dollar bill wallpaper, and try prickly pear ice cream (an Arizona delicacy) here. Make sure to quickly stop at Canyon Lake Vista for stunning views over the lake on your way to Tortilla Flat from Goldfield. 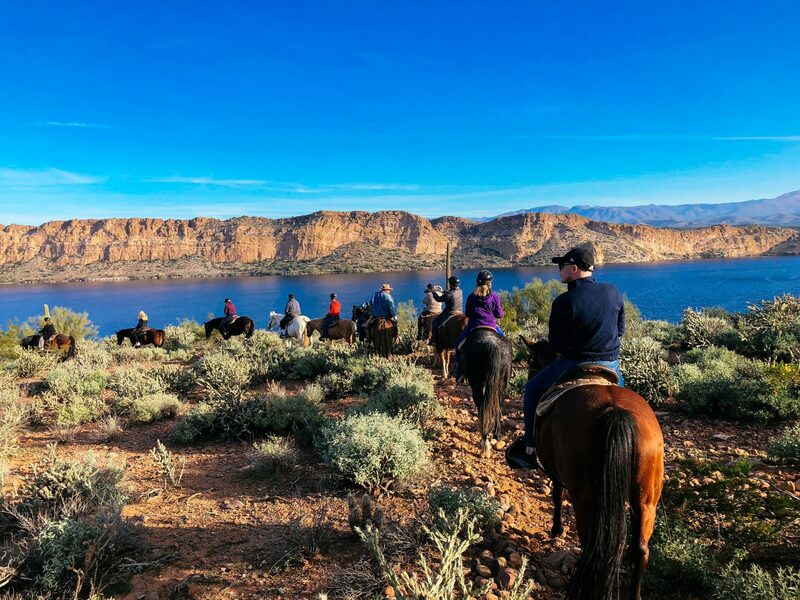 Horseback riding at Saguaro Lake Guest Ranch – Saguaro Lake Guest Ranch is not only a cozy place to stay in Mesa, they also have their own stables below the ranch. 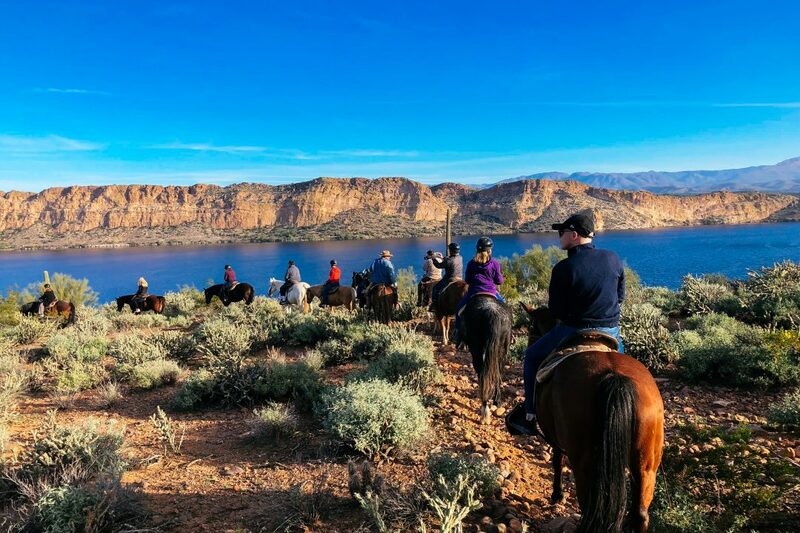 If you stay on the property (or even if you don’t), horseback riding is a must in Mesa. This is another Arizona experience that is quintessential to visiting the state. Not to mention, the trails they take you out on are an impressive juxtaposition of colors, desert, water, and cacti. 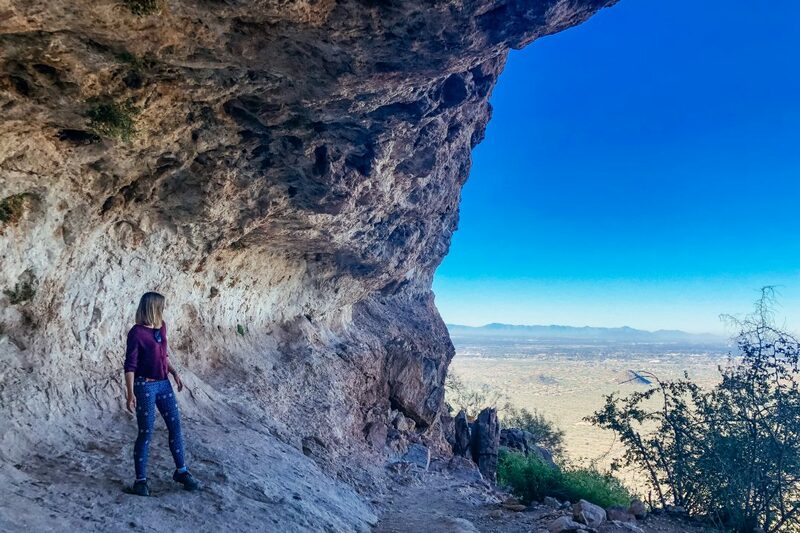 Hiking in the Tonto National Forest – You’ll notice that hiking is a common theme throughout this Arizona road trip itinerary, because it’s one of the best ways to see the beauty of the state. 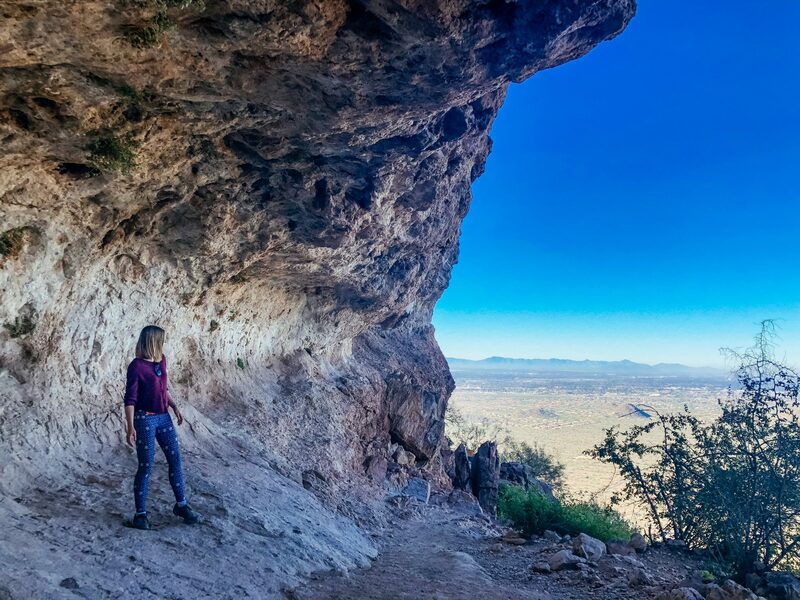 Start off your first hike in Arizona in the Tonto National Forest, either tackling the Wind Cave, Pass Mountain, or Wave Cave trail. Tackling the Wind Cave hike during my time in Mesa. Wind Cave is probably the most popular and convenient to get to and only takes a couple of hours to complete, so it’s the perfect option if you want to get in a quick hike before hitting the road. Fresh Foodie Trail – The farm-to-table movement has come in hot to Mesa, so if you love good food, the Fresh Foodie trail is something you should look into doing throughout your time in the region. There are a list of restaurants and businesses that are a part of the trail that you can stop in at. You can find the full list here. Kayak at Butcher Jones Beach – Another outdoorsy experience you could tackle if you want to save your Arizona hiking for Sedona and the Grand Canyon, or you’re not into horseback riding. 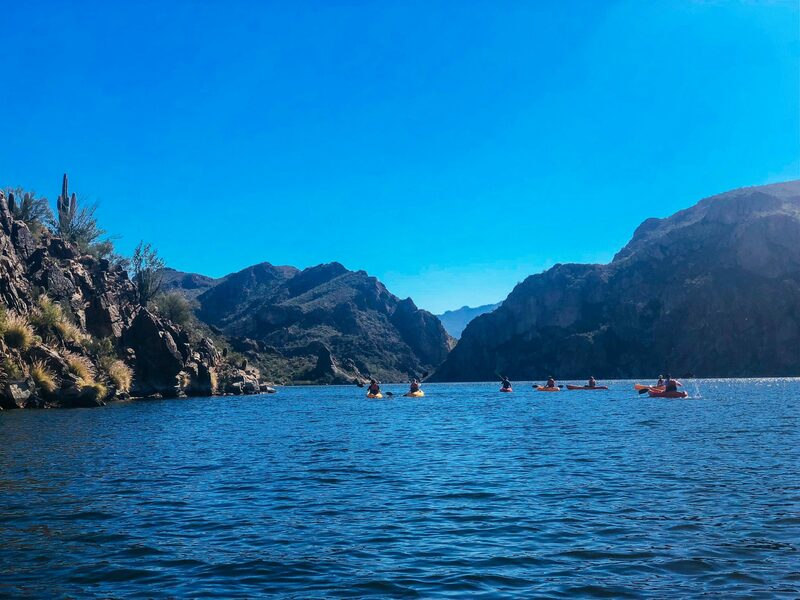 Butcher Jones Recreation Area is a stunning spot to kayak, only a short drive from downtown Mesa and offers views of towering yellow cliffs and a lot of cacti. 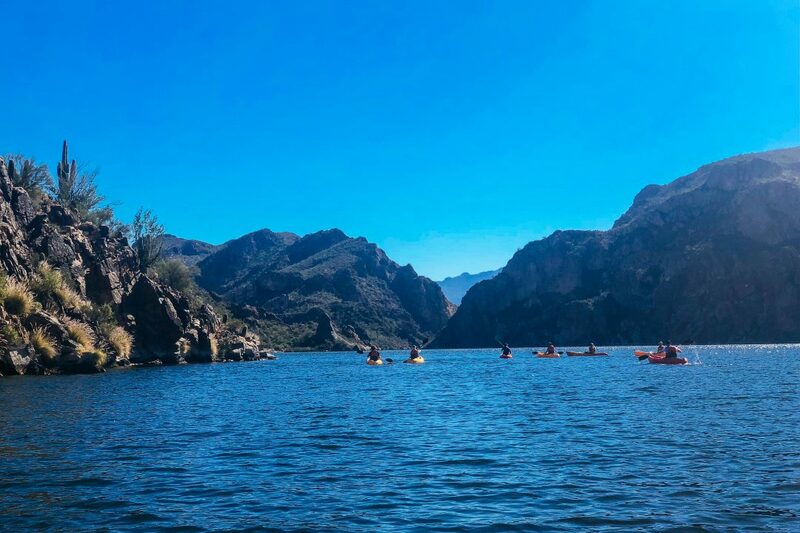 If you’re staying at Saguaro Lake Guest Ranch, they can set up a kayak tour for you, or you can rent kayaks from one of the local kayak companies in Mesa. Cloth & Flame Dinner Experience – Probably the most unique and magical experience I had in Mesa was a Cloth & Flame dinner. 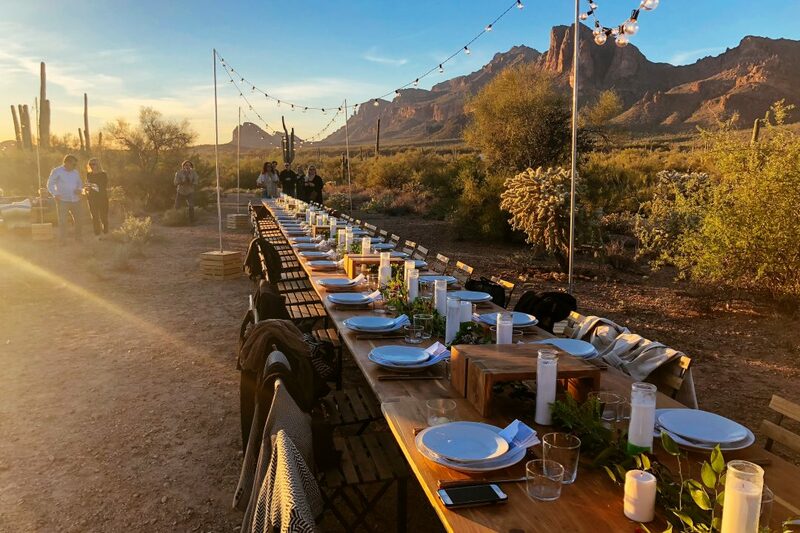 The dinner was out in the desert amongst the Superstition Wilderness, with family-style seating at a huge table and a delicious meal (and cocktails) at sunset. It was something out of a glossy travel magazine or Pinterest feed. 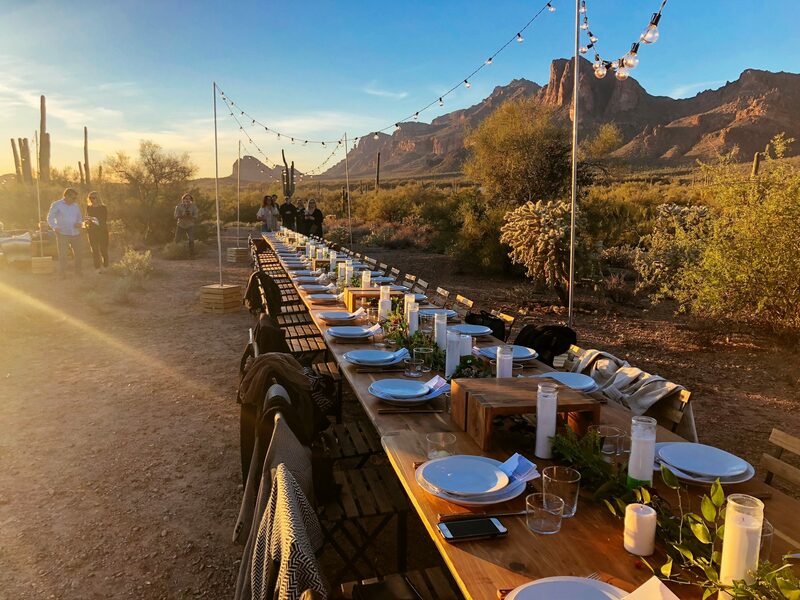 These dinners book out fast, so if you’re planning a trip to Arizona, make sure to book this experience a few months in advance to secure a spot. Looking for more tips on what to do in Mesa? Read my post about it here. Baymont Inn – A cozy and clean budget accommodation near the Mesa Arts Center and Museum of Natural History that offers an outdoor swimming pool, friendly service, and continental breakfast. Hotel Hyatt Place Mesa – Only a 15 minute drive from the Phoenix Airport, Hotel Hyatt is a central mid-range hotel that has an outdoor swimming pool, large hot tub, and even a small mini golf course. They have an on-site restaurant and bar for dining options at any time of the day. Saguaro Lake Guest Ranch – If you’re looking for a relaxed and disconnected first night in Arizona, I could not recommend Saguaro Lake Guest Ranch enough. The accommodation is situated at the edge of the Tonto National Forest right next to the Bulldog Cliffs and Salt River. They offer horseback riding and kayaking excursions for an additional price, as well as a shuttle from the airport. If you’re looking for one of the most scenic drives in Arizona, look no further than traveling to and from Sedona and admiring the famous red rocks from the road. 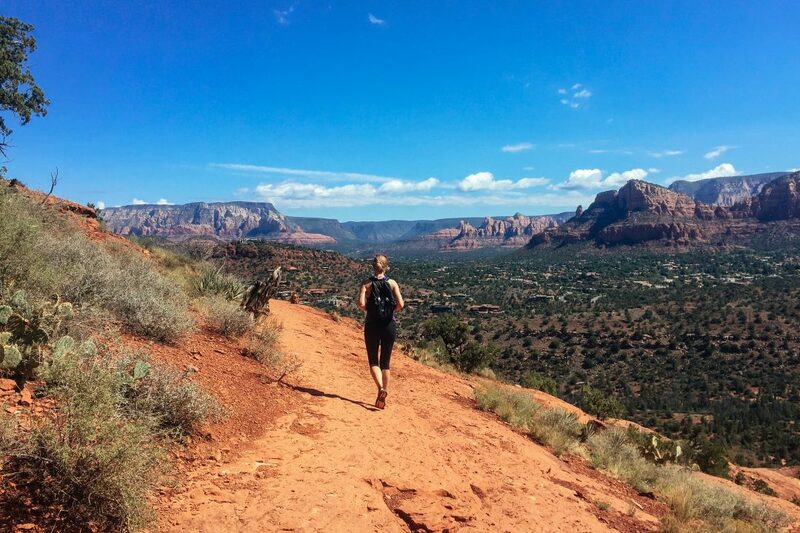 Hiking Sedona is one of the best ways to immerse yourselves in the famous Red Rock scenery. Sedona has become very popular in recent years, a close runner up to the Grand Canyon in terms of popular tourist attractions in Arizona, so in the summer months, especially, expect it to be a busy spot with travelers coming through. However, you can’t go to Arizona and not see Sedona. The landscape is like nothing I’ve seen before – I never knew rocks could be classified as beautiful until I went here for the first time. 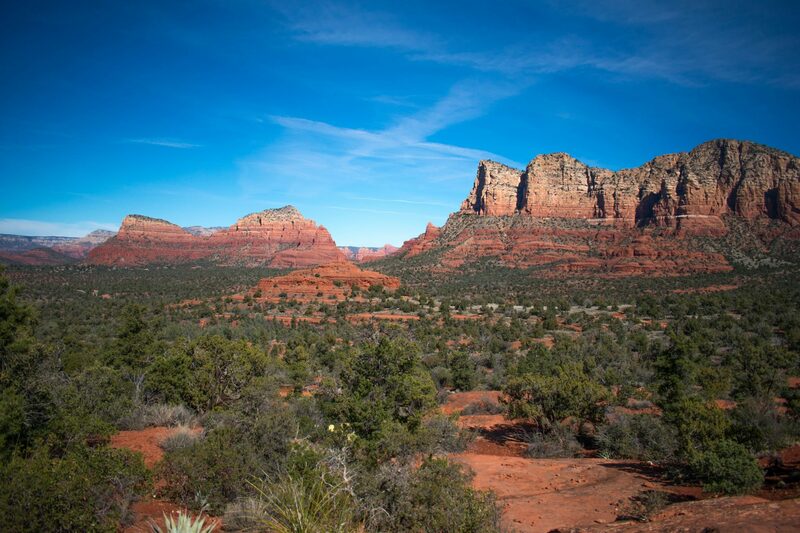 Take a jeep tour – The popular Sedona Pink Jeep Tours are a popular way to get a good overview of the area and go off roading in style. 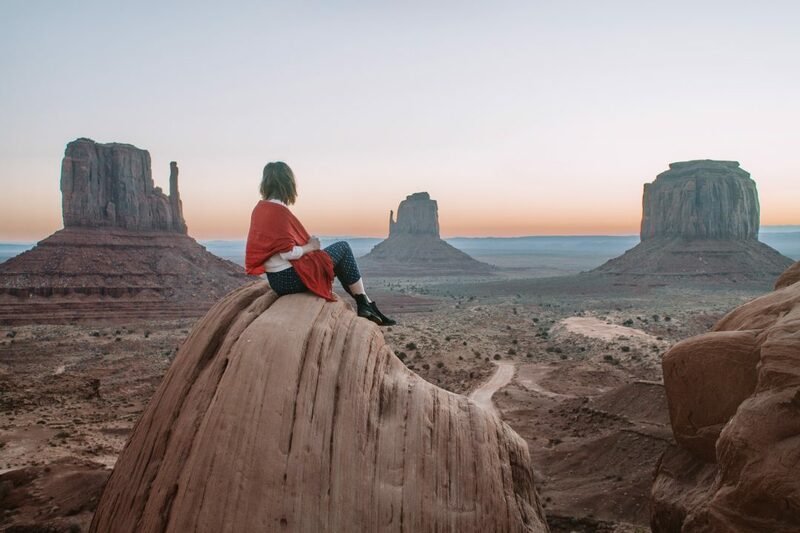 They have a variety of different tours to choose from that take you around iconic red rock formations, Western movie filming locations, and ancient desert ruins. Their Broken Arrow 2 Hour Sedona tour is a good introductory one to take. 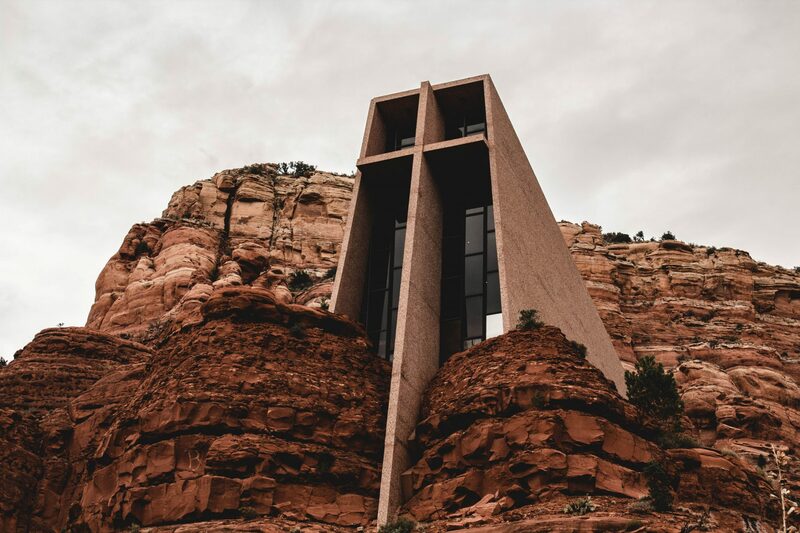 Chapel of the Holy Cross – A chapel located in the middle of the desert nestled amongst the red rocks. It’s equally eccentric and impressive and one of those things you have to see in person to truly appreciate the beauty of it. Red Rock Crossing – One of the most photographed spots in Sedona, the Red Rock Crossing trail in Red Rock State Park is one of the best places to immerse yourself in the scenic red-tinged setting. The hike is only about 1.1 miles, and includes views of the famous Cathedral Rock, so it’s a good option if you’re looking for a short and easy day hike that is full of beautiful views. Parking is $10. Hononki and Palatki – An ancient archeological site that is located in Coconino National Forest near Sedona. This is where you can find the largest cliff dwellings in the region from A.D. 1150 to 1350 via three short and easy trails. 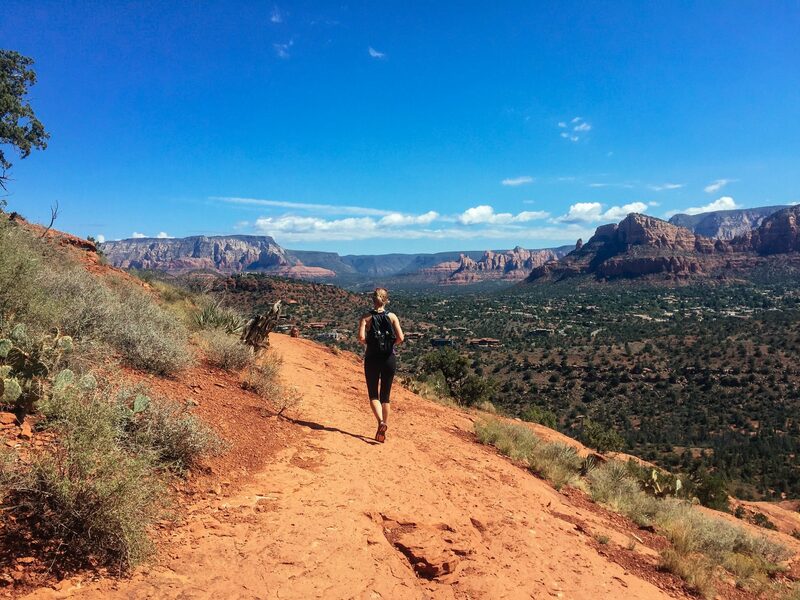 Airport Mesa – If you want expansive views that look out over Sedona and its red rock formations from afar, there’s no better place to stop than Airport Mesa and the Airport Loop Trail. Sky Ranch Lodge – If you’re looking for an affordable accommodation in Sedona that offers breathtaking views, look no further than Sky Ranch Lodge. The lodge is all about that rustic charm and comfort and located on top of a mesa for optimal views. Casa Sedona Inn – An accommodation full of personal touches, welcoming hospitality, and a breakfast that guests constantly rave about. Great for couples or friends who are looking for a tranquil and romantic property off the main road. A Sunset Chateau B&B – One of the top rated boutique bed & breakfasts in Sedona, filled with whimsical artwork, a delicious breakfast, pool, stunning views every direction you look. The property is located next to some of the most popular Arizona hiking trails in Sedona. Next up is the site that Arizona is most famous for – the Grand Canyon! 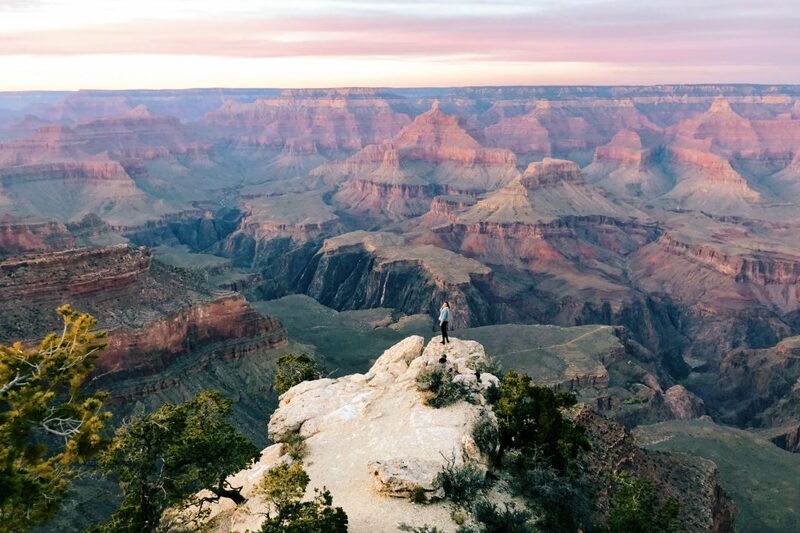 The Grand Canyon attracts over 5 million visitors per year, and for good reason, it’s unlike anything you’ve ever witnessed before. The depth and expansiveness of the canyon is impossible for your brain to comprehend – it’s that big! This was my second time to the Grand Canyon, and it was just as amazing as I remembered it from a couple of years ago. Make sure to dress warm, because although you’re still in Arizona, you’re in the brisk high altitude part of the state now. The South Rim of the Grand Canyon is around 5,000 ft above sea level, and the North Rim gets up to 8,000 ft. – aka it quickly gets damn cold no matter if you’re there during the height of summer or the winter. Pack appropriately. 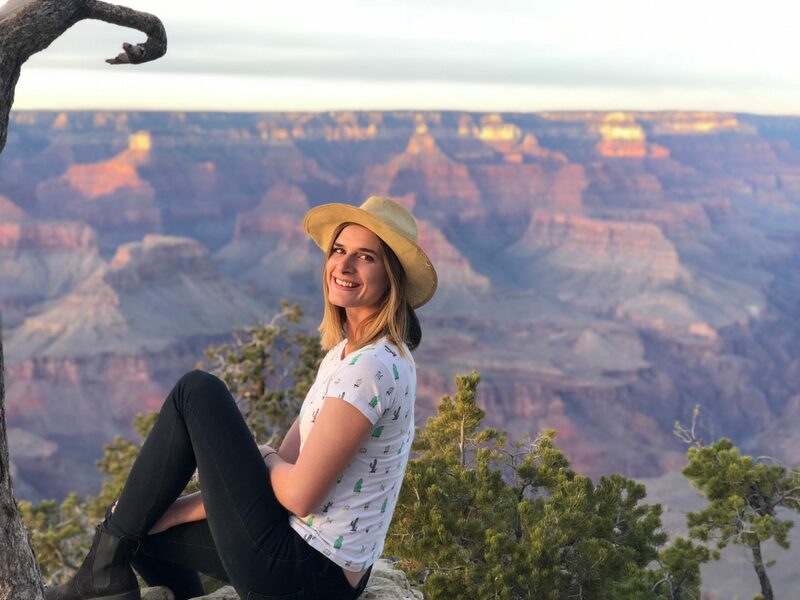 You could spend weeks around the Canyon and never see all there is to see, so in order to make it slightly less overwhelming, these are the top things I’d recommend experiencing if you’re planning a trip to the Grand Canyon, whether it’s a Grand Canyon family vacation or an Arizona honeymoon. Travel Tip: Stop in Flagstaff on the way to the Grand Canyon from Sedona to see the historic train depot from the Santa Fe Railroad. It’s also a city that is along the famous Route 66 and a great place to stop for lunch. 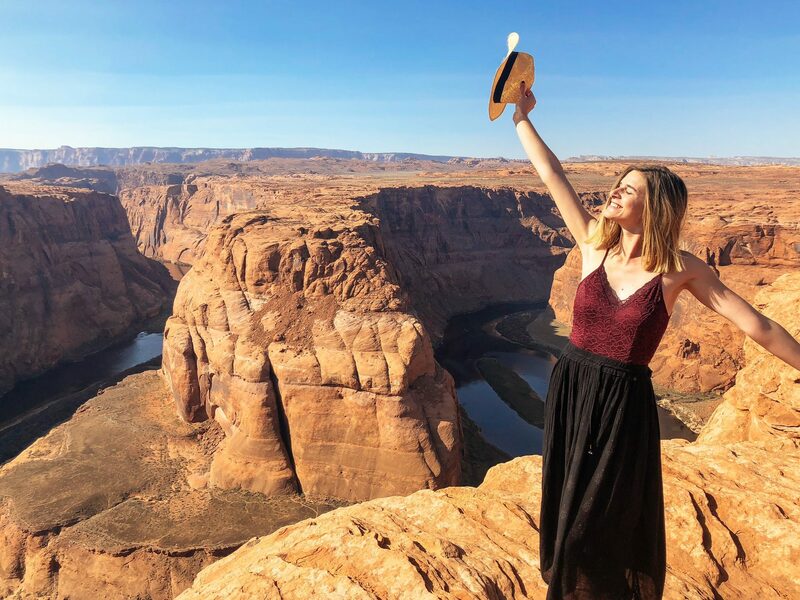 Watch the sunrise and sunset – One experience you have to include in your Grand Canyon itinerary is watching the sunrise and sunset over the canyon. It’s one of the most magical experiences because the colors of the canyon during dusk and dawn are other worldly. It might be cold, but it’s worth it for the technicolor views you’ll witness. Grand Canyon road trip from South to North Rim – In case you didn’t realize, the Grand Canyon is huge! It takes about 4 hours to drive from the South Rim to the North Rim Visitor’s Center, so why not make it its own road trip to see as many angles of the Canyon as possible? There are plenty of lookout points along the way from the South Rim to the North Rim, as well as a variety of hiking trails. Just note that during winter the North Rim is sometimes closed because of snow. Shoshone Point – Off East Rim Drive, you’ll find Shoshone Point, one of the most famous lookouts in the Grand Canyon that offers 180 degree views. Although you technically can drive to this spot, the access road requires a permit from the National Park Service and is often closed for private events, so it’s best to plan to do the short 2.1 mile hike in. Desert View Watchtower – A 70-foot historic tower located on the South Rim of the Grand Canyon, which was designed by architect Mary Colter in 1932 in the style of an Ancestral Puebloan tower. It has special significance for local Native American tribes. Native American art in the Desert View Watchtower. 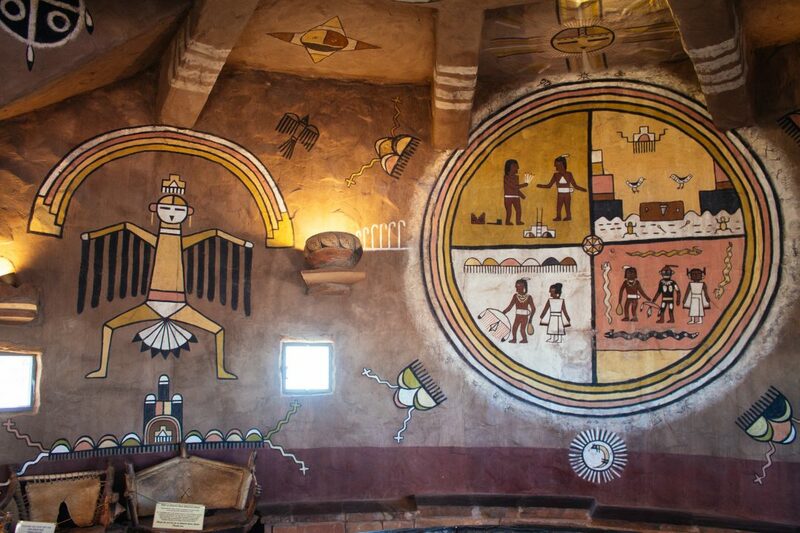 There are wall murals by Hopi Artist Fred Kabotie inside the tower, and views of the Colorado River and Canyon geology looking out from the tower. See it from the air – One of the best ways to see the Grand Canyon is from the air. If you’re going to splurge on a helicopter ride in your life, I’d recommend doing in either in Hawaii or the Grand Canyon. Seeing the Grand Canyon from lofty heights will only make you realize even more how impressive of a natural sight it is. If you’re going to go big with a helicopter tour, I’d recommend this 45 minute Grand Canyon Helicopter Tour from the South Rim. If you’re really feeling adventurous, there’s also a skydiving tour over the Grand Canyon, which you can find here. I can’t think of a more beautiful spot to get your adrenaline thrills. Hike it (the options are endless) – If you’re taking the time to drive all the way to the Grand Canyon, it’s worth it to hike at least part of it. There are so many people that just come to the South Rim every year for a quick photo stop and to maybe watch the sunset, but there is so much more versatility (and angles) to the Canyon that you can’t quite capture from the most popular lookout point. 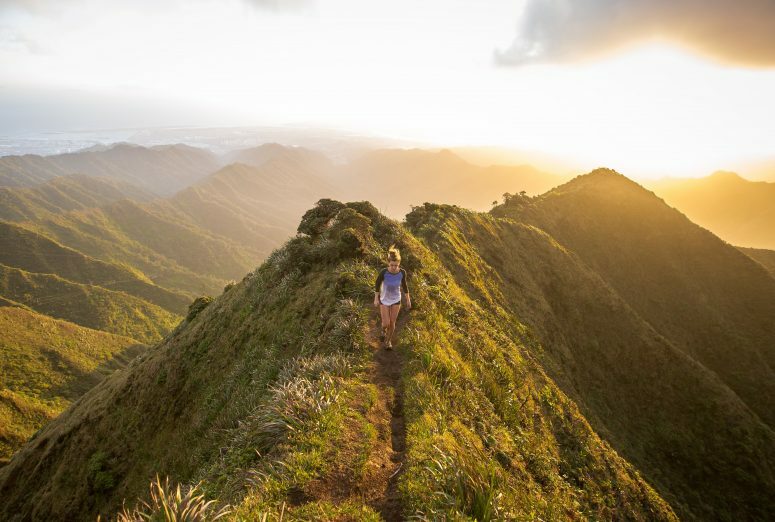 Luckily, no matter what your fitness level is, there are a variety of trails that all offer great views – from the short and sweet to the multi-day treks. Planning a trip to the Grand Canyon? Make sure to add in enough time to at least do a day hike. Just keep in mind that the majority of these are hiking down into the Canyon, so always make sure you have enough energy to hike out because it will take twice as much energy and time. It’s also important to keep in mind that the weather in the Grand Canyon can change in an instant, so to bring appropriate gear, food, and plenty of water. Grandview Trail – Built in 1893 as a mining route, today the Grandview Trail is another most popular spot to hike in the Grand Canyon. The full trail is 9 miles roundtrip and not recommended as a day hike, but if you only go to the first lookout, Coconino Saddle, it’s 2.2 miles roundtrip and takes 2-4 hours to complete. The second lookout is Horseshoe Mesa, which is 6 miles roundtrip and takes 6-9 hours to complete. This spot is probably the furthest you should go for a day hike. To get to the trailhead, drive to Grandview Point, 12 miles east of Grand Canyon Village. South Kaibab Trail – The South Kaibab Trail is arguably the most popular hiking trail in the Grand Canyon, after the Bright Angel Trail. It’s an ideal option because it’s a straight hike down, with plenty of lookout points along the ways and opportunities to turn back once you’ve had enough hiking for the day. The trail to Cedar Ridge is only 3 miles and Skeleton Point is around 6 miles roundtrip, which is the furthest I’d recommend going if you’re not planning on spending the night at the bottom of the Canyon and hiking out the next day. This is not a great trail if you get vertigo or you’re afraid of heights because there is not much in the way of barriers between the trail and the drop off into the Canyon. If you can get past that though, this is one of the most beautiful places you can hike in the Grand Canyon and well worth the effort. The trail starts near Yaki Point, with multiple free shuttles to the South Kaibab Trailhead per day from Canyon View Information Plaza. Bright Angel Trail – The most popular trail on the South Rim, the full trail is about 15.6 miles roundtrip and takes 2-3 days to complete. However, if you want to experience what makes this trail so magical in a short amount of time, it is possible to do a day hike. If you’re just hiking for the day, it’s recommend stopping at either the 1.5 Mile Resthouse (2-4 hours roundtrip) or 3 Mile Resthouse (4-6 hours roundtrip). 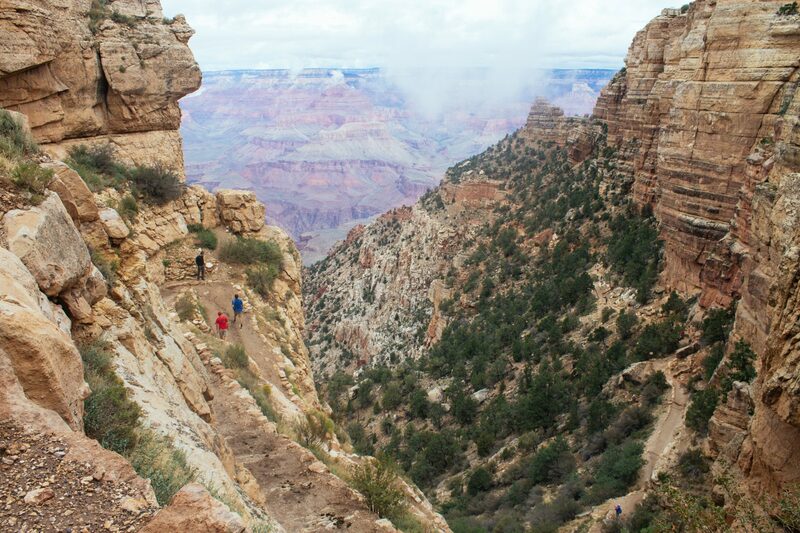 Similar to the South Kaibab trail, it’s a steep hike that goes straight down into the Canyon so make sure you have the energy to come up the way you came down. The trailhead is located on the South Rim, just west of Bright Angel Lodge. If you have at least three additional days to spare, consider going on a rafting trip down the Colorado River. I’ve heard it’s a once-in-a-lifetime experience that is one of the most unique, impressive, and adventurous ways to experience the canyon. There are plenty of tour options for these multi-day whitewater rafting trips. Two of the most highly recommended tour companies to go with are Wilderness River Adventures and Grand Canyon Whitewater. *If you’re traveling on a budget and would rather camp, there are BLM lands near the Grand Canyon entrance that are free to camp at. Read this article for more info on how to find these campsites. Quality Inn Near Grand Canyon – If you’re just looking for a simple accommodation that is relatively affordable for the area, this is a great option that’s close to South Rim. Includes breakfast. Grand Canyon Plaza Hotel – Right next to the entrance of the Grand Canyon, Grand Canyon Plaza Hotel is a more unique stay then the Quality Inn and only slightly more expensive. They have two restaurants on site, a bar, swimming pool, and are pet-friendly. The Grand Canyon Hotel at the Grand Canyon – If you’re looking for a more luxurious stay nestled right next to Grand Canyon Village. Known for their clean rooms, friendly hospitality, saloon, and heated swimming pool and jacuzzi. 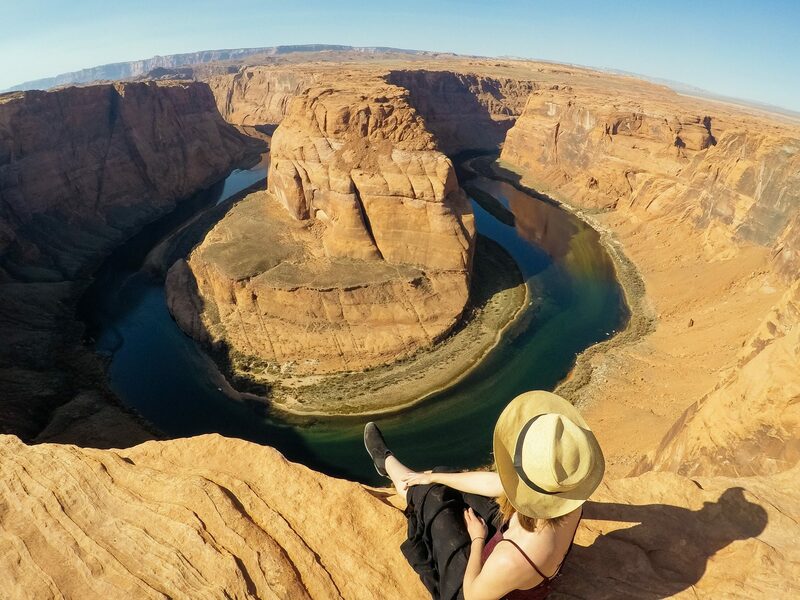 When planning a trip to Arizona, Page usually comes up in travel research as a must-see region due to two famous sights – Horseshoe Bend and Antelope Canyon. This part of northern Arizona is a different kind of beauty from the low desert with its many Saguaro cacti, but the deep canyons and cliffside views are well worth visiting. 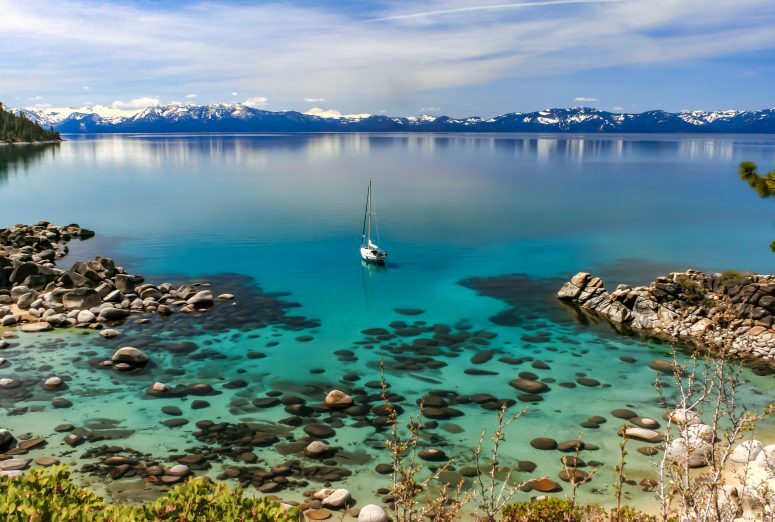 If you have a day or two extra, camping on Antelope Island is a great detour for the more adventurous traveler, because it’s surrounded by a ton of natural beauty and aquamarine waters. 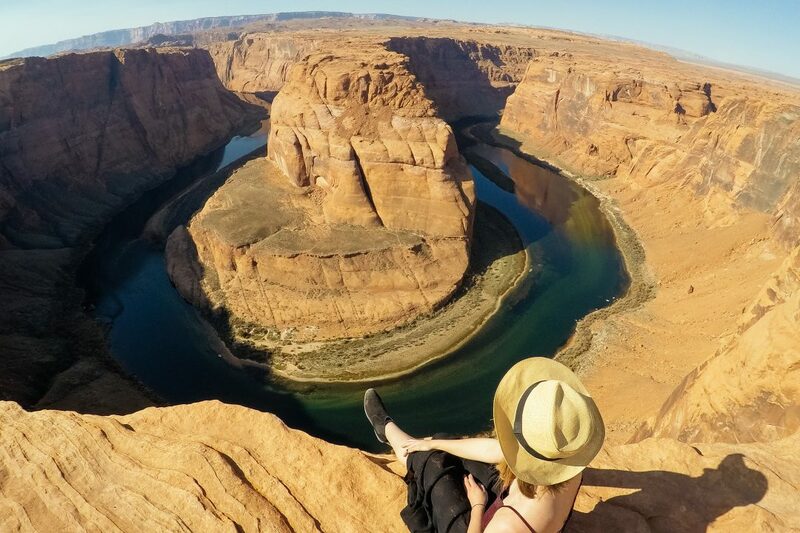 Horseshoe Bend – Your Arizona adventures would not be complete without a visit to the Instagram-famous Horseshoe Bend. It’s a short hike to the lookout from the parking lot, but the view from the top is magical. 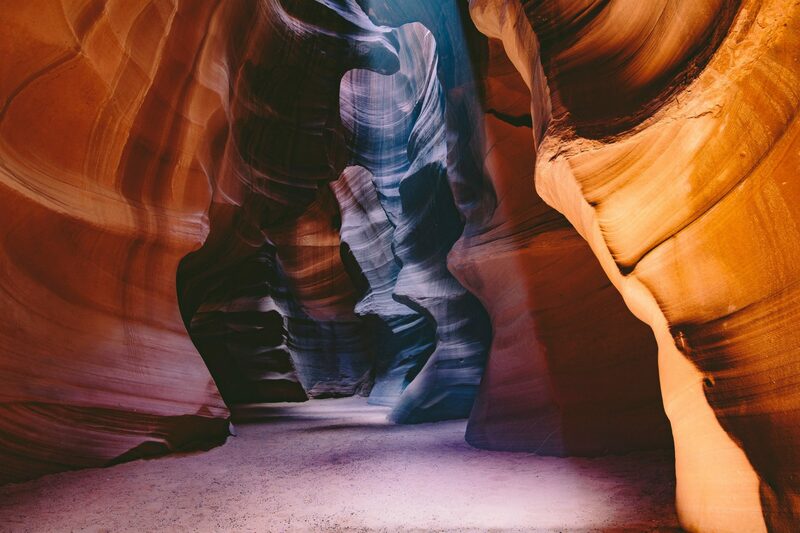 Lower & Upper Antelope Canyon – Because of safety issues and the risk of flash floods, the only way to see Lower and Upper Antelope Canyon is through an official guided tour (which you can book here or here). These book out in advance, especially in the summer, so don’t expect to show up and book a same day tour. I’d recommend trying to book at least a week or two in advance. Photography enthusiasts and anyone who enjoys ethereal landscapes will be impressed with these naturally carved out canyons. They’re truly a sight to behold. SUP to Antelope Island – There are a couple of outfitters around Lake Powell that rent out paddle boards and kayaks. It’s not only a great workout to paddle around and to Antelope Island, but a stunning way to spend a sunny afternoon. If you have the time to spend a few hours out on the water, this is one of more unique things you can do in Page to enjoy the scenery. Rainbow Bridge National Monument – Thought of as the world’s highest natural bridge at 290 feet, Rainbow Bridge National Monument is technically in Utah, but also near Lake Powell and a sacred site to the Navajo Nation. 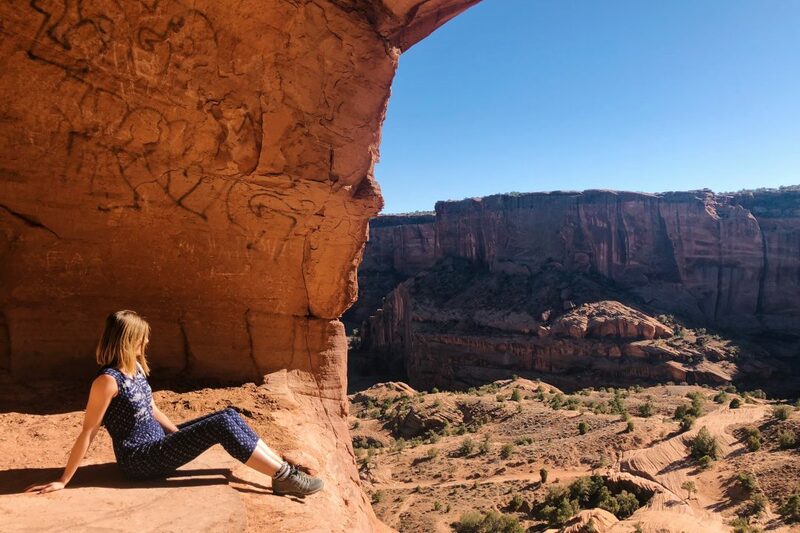 You can either get to the bridge via boat on Lake Powell or through a hike (13-14 miles), however you need a permit for both, so it’s recommended to do a guided tour to get there. 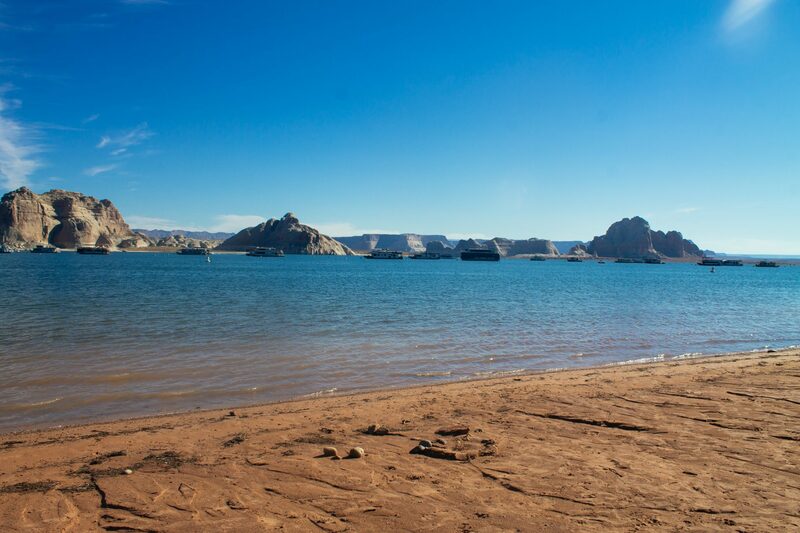 For boat tour information and reservations call 1-800-528-6154 or go online at http://www.lakepowell.com. *If you’re traveling on a budget and would rather camp, there are BLM lands near Lake Powell that are free to camp at. Read this article for more info on how to find these campsites. You can also camp on Antelope Island if you reserve here. 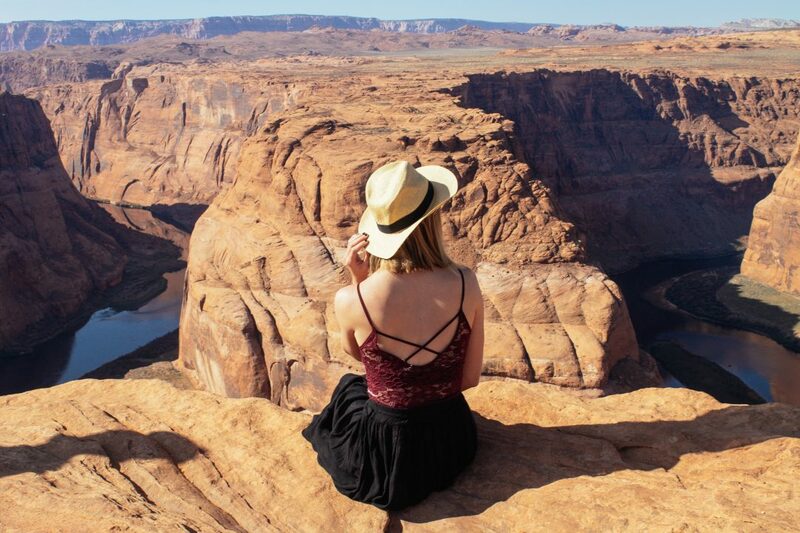 Best Western View of Lake Powell Hotel – Only a 10 minute drive from Horseshoe Bend and Lake Powell, this affordable hotel offers great views of Page and a comfortable stay. Known for their free coffee and tea all day, central location, good breakfast, and clean rooms. Country Inn & Suites by Radisson, Page, AZ – One of the top-rated properties in Page, Country Inn & Suites is a brand new hotel that is clean, comfy, and quiet, with Scandinavian-inspired decor, a fitness center, pool and jacuzzi. Shash Dine’ EcoRetreat – If you’re looking for the most unique glamping accommodation in Page, the Shash Dine’ EcoRetreat does not disappoint. This is a great place to reconnect with nature, enjoying stargazing without the light pollution, and treat yourself to spa services. The retreat offers tons of tours through the property, so you could see everything you want to see in Page while staying here. Great for couples and families. On the border of Arizona and Utah sits Monument Valley, a must-see sight for any Arizona itinerary. This is without a doubt one of the most magical places I visited in Arizona and far less crowded than the Grand Canyon. Monument Valley is where a lot of the old Western movies with John Wayne were shot, the landscape is iconic with its huge rock formations, and the rural nature of the area only encourages self-reflection. This is one of the most photographed spots in the world for a reason, it’s ridiculously beautiful. From the visitor’s center you can see Utah, New Mexico, and Arizona. It is a bit of a drive to get out to the valley, but its well worth it to see this special spot at the edge of Arizona. 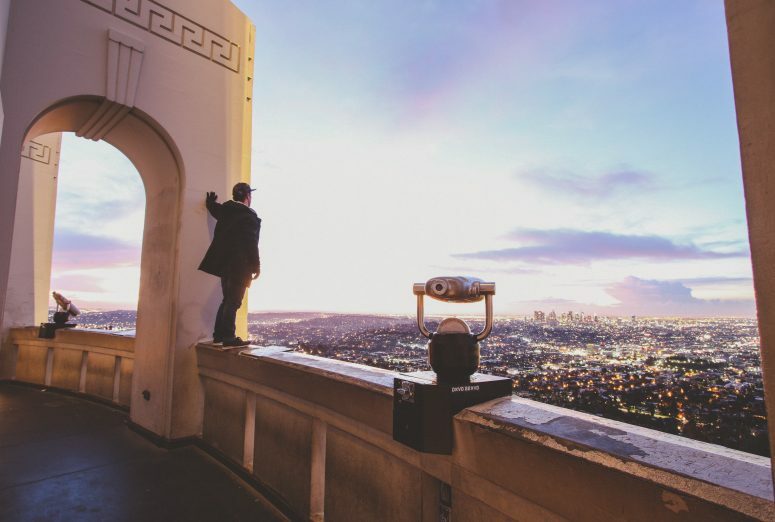 Watch the sunrise and sunset over the valley – Similar to the Grand Canyon, this is one of those places where its worth watching both the sunrise and sunset over the valley to see the different hues that come out at dawn and dusk. Goulding’s Lodge – A trading post, museum, and one of the best places to stay near Monument Valley. Goulding’s history goes back to the 1920s when sheep trader Henry Goulding and his wife Leone (aka “Mike”) became enamored with the area and decided to purchase land and set up a trading post. Although Goulding bought land that used to be part of the Paiute Indian Reservation before it was relocated, he was known for having a good working relationship with local Navajos whom he employed and regularly traded with. In the 1930s, when the Great Depression hit the Goulding’s business hard, Henry and Mike went to Hollywood and convinced John Ford to film his Westerns in Monument Valley. With the influx of film crew, the trading post gradually upgraded throughout the years to host thousands of visitors, and eventually became a tourist attraction of its own. The museum, John Wayne’s cabin, and the tours they offer around the valley are worth experiencing. 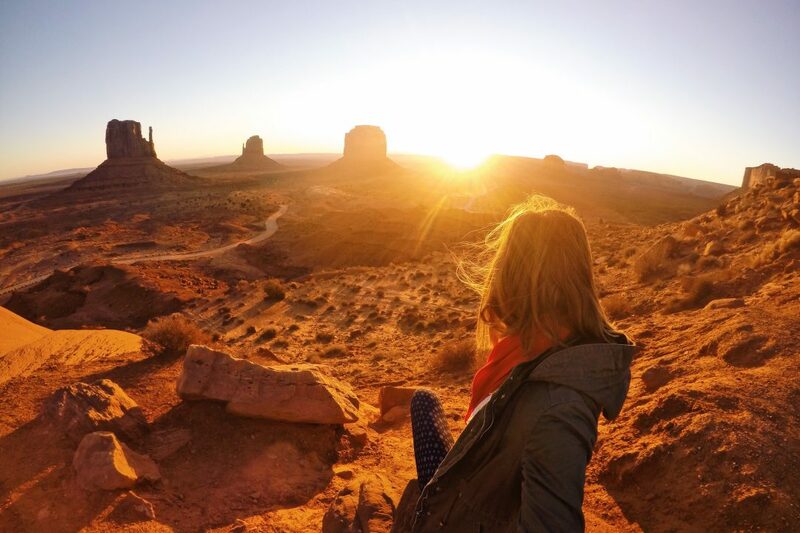 Take a tour with a local Navajo Guide – Monument Valley is located on the Navajo Nation Reservation, so a lot of areas are off limits without a permit or local guide. 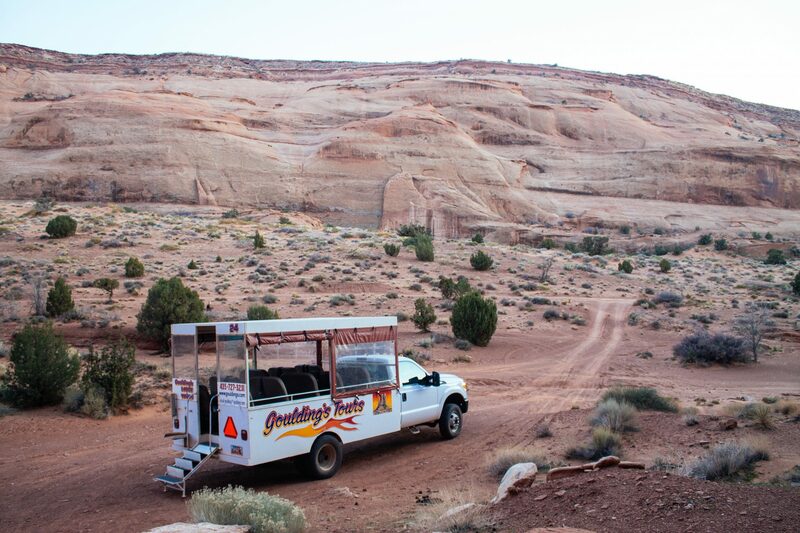 Even more than that though, if you’re traveling on Navajo land, it’s respectful and highly recommended to hire local Navajos to take you around and show you the places that are most important to them. You can book tours out of the Monument Valley Visitor’s Center and Museum, which offers anything from guided 4×4 jeep tours to hikes with local Navajo guides. Drive the 17-Mile Tribal Park Loop – If you’re set on doing your own tour, there is the 17-Mile Tribal Park Loop drive that you can tackle on your own as long as you have the right vehicle (i.e. 4WD). Although you’re not allowed to go off the loop at all, the drive does provide some stunning perspectives of Monument Valley. It generally takes 2-4 hours to do the full drive since the average speed limit is 15 mph and bumpy, and the entrance to the loop is $20 per car for up to 4 people. Wetherill Inn– If you want to stay right next to Monument Valley, it’s going to be a bit pricier. 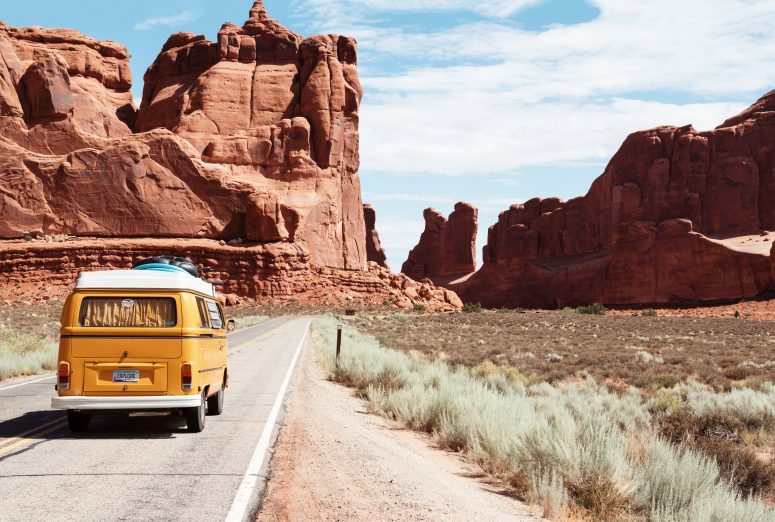 A more affordable alternative is staying in the small town of Kayenta, about a 25 minute drive from Monument Valley. Wetherill Inn is one of the top rated accommodations in Kayenta, and provides basic motel amenities and comforts. This place is simple but ideal if you just need a quick and cheap place to stay for a night. The View Hotel – The View Hotel and Goulding’s are really your only options if you want to stay next to Monument Valley. The View may not have the history of Gouldings, but they are slightly less expensive and technically the only hotel located in Monument Valley (although Goulding’s is literally just down the road). 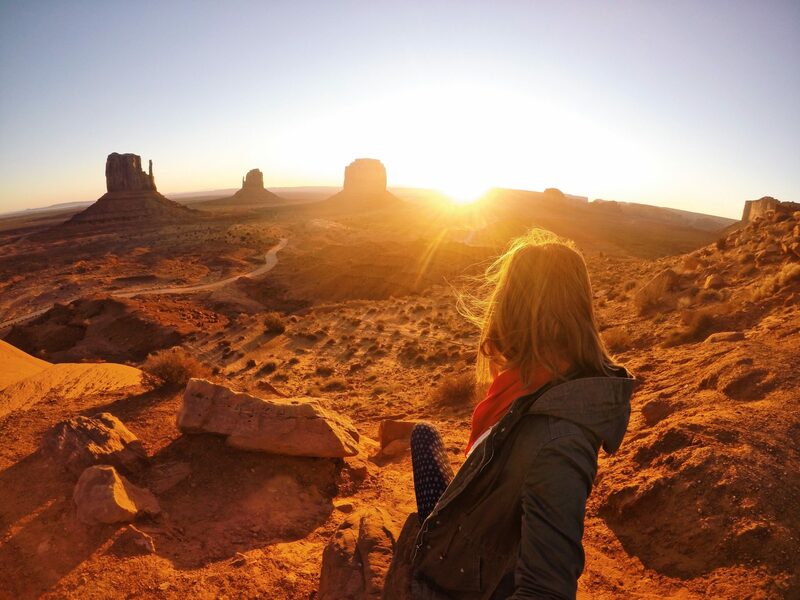 Goulding’s – The #1 recommended hotel near Monument Valley for its old-school charm, variety of accommodations, and history. If you want to stay where John Wayne used to stay and get that Wild West feel, this is where you should stay. They also offer quite a few tours around Monument Valley that you can book directly with the lodge. Winslow is a small town and can easily be missed if you have a short time in Arizona and need to cut out a stop. However, if you have the time for a one night stopover, Winslow might just surprise you with its small town charm. It’s also the perfect halfway stopping point if you’re driving all the way from Monument Valley to Phoenix. The historical La Posada Hotel located in Winslow. If you’re coming from Monument Valley to Winslow I would highly recommend stopping in at Canyon de Chelly for an afternoon. Although not as famous as the Grand Canyon, Canyon de Chelly is a stunner and such a cool place to explore. 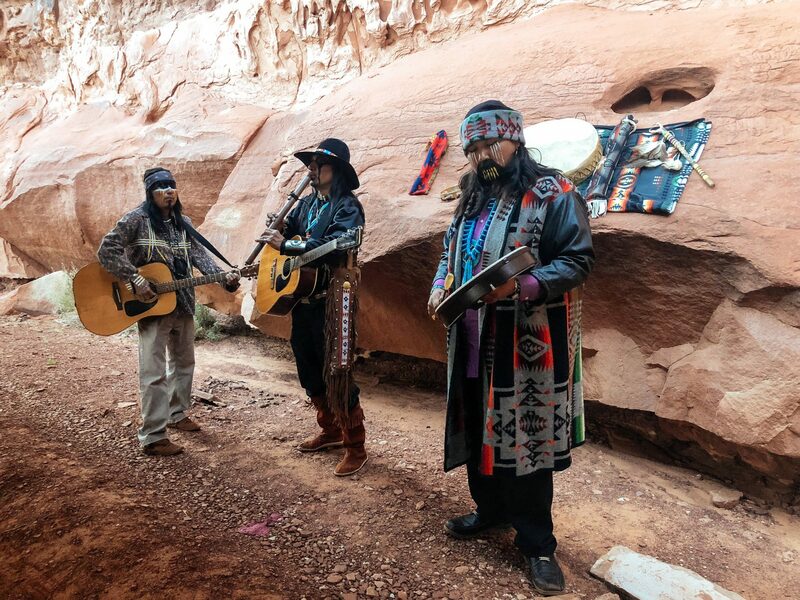 It has been a home to Native American tribes for centuries, and you can still find ancient ruins from the Anasazi Indian within the Canyon, as well as petroglyphs that are from around 1100 BC. Canyon de Chelly – Sign up for a tour with Thunderbird Lodge & Tours. I went our with Harold for the day and had a fantastic time exploring the Canyon and learning about local Navajo history. 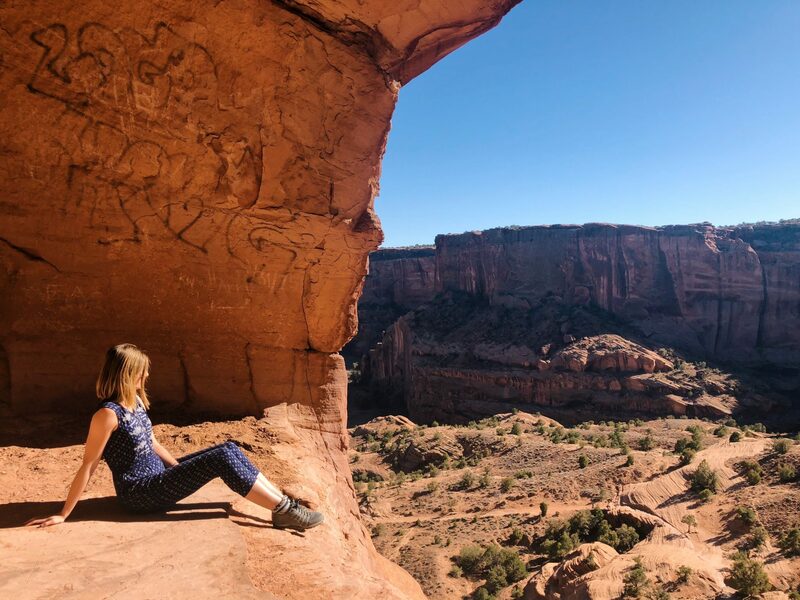 As mentioned above, there are a lot of reasons to visit this underrated Canyon, from its natural beauty to ancient history and plenty of Native American folklore. Once you get back from exploring the Canyon, make sure to try a Navajo Taco from the lodge. It’s quite the foodie experience! 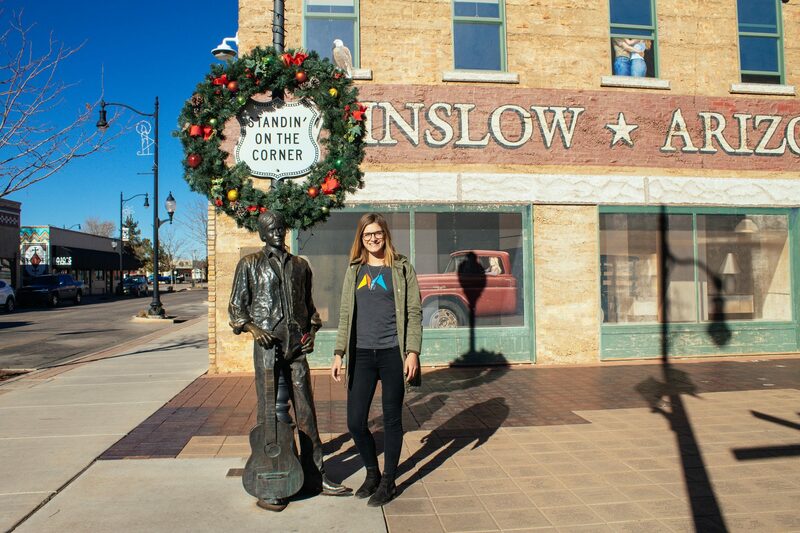 Stand on the Corner – Once you’re actually in Winslow, the biggest tourist attraction in this town is Standin’ on the Corner. If you are a fan of a band called the Eagles, you may remember that Winslow is mentioned in their song Take it Easy. Standin’ on the Corner in Winslow, Arizona! Well, today you can pose next to statues of Glenn Fry and Don Henley on a corner, as well as buy souvenirs from the kitschy tourist shops next door that sell ‘Standin’ on the Corner’ and Route 66 memorabilia. As a huge Eagles fan, I happily obliged. Old Trails Museum – A great place to learn more about the history and culture of Winslow, broken down by detailed themed exhibits and historical artifacts from past residents. Rodeway Inn Winslow – If you’re looking for a no frills, inexpensive place to stay for a night in Winslow the Rodeway Inn is your best bet. All the basic amenities are included, as well spacious rooms and friendly staff. Best Western Plus Winslow Inn – Another inexpensive option for a one night stay in Winslow, offering slightly more luxury than the Rodeway Inn. Guests especially loved the breakfast, comfy beds, and quiet rooms. Includes a swimming pool and fitness center. La Posada Hotel – By far the coolest and most historical place to stay in Winslow, La Posada Hotel is a tourist attraction in its own right with its history as a stop on the Santa Fe Railroad and The Harvey Girls. The hotel was designed by famous female architect, Mary Elizabeth Jane Colter and has hosted several famous guests over the years, such as Albert Einstein, Amelia Earhart, and Franklin D. Roosevelt. 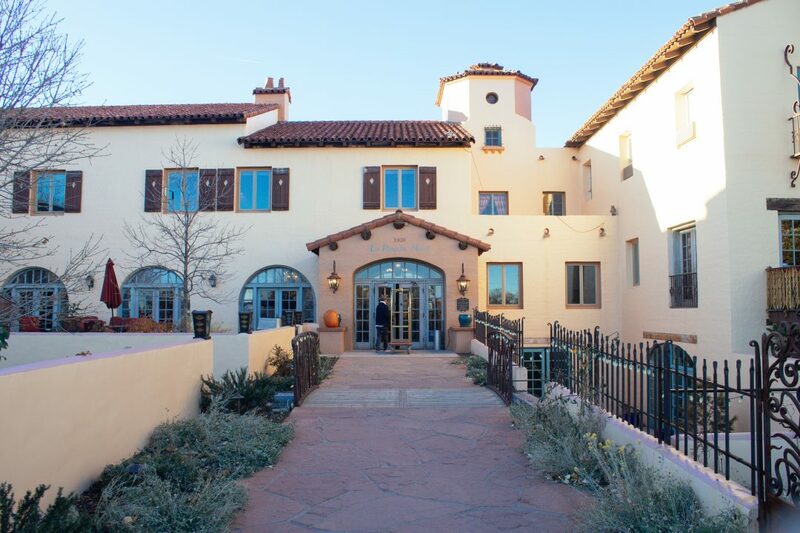 Their restaurant, the Turquoise Room, offers fine dining and delicious regional contemporary Southwestern cuisine. Even if you don’t stay at the hotel, this restaurant is a great dinner option in town. And finally, you’ll either be flying out from Phoenix today or staying one more night to see what Arizona’s main city has to offer. 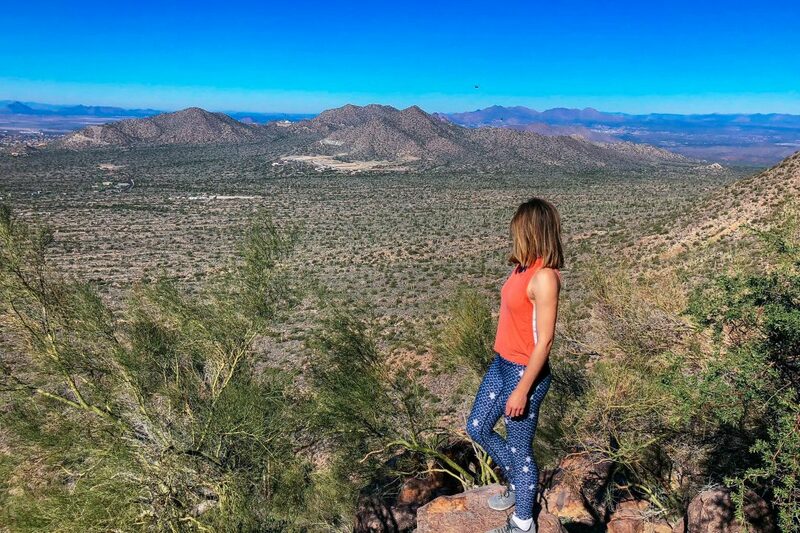 If you have the time, it’s worth it to spend a day in Phoenix to explore the city’s attractions or have one more excuse to get outside and go hiking (with trails right outside the city). Street art on Roosevelt Row – The place to go for Phoenix street art, Roosevelt Row is a walkable creative district in downtown Phoenix. In addition to street art, it also has art galleries, good restaurants, bars, and boutique shops. If you happen to be in Phoenix on the first Friday of the month, you can join in on the First Friday’s Art Walk. Phoenix Art Museum – The southwest’s largest art museum, showcasing a wide range of art styles from the Renaissance to modern day and spanning a variety of cultures. If you’re an artsy person this is a must-see attraction in Phoenix. 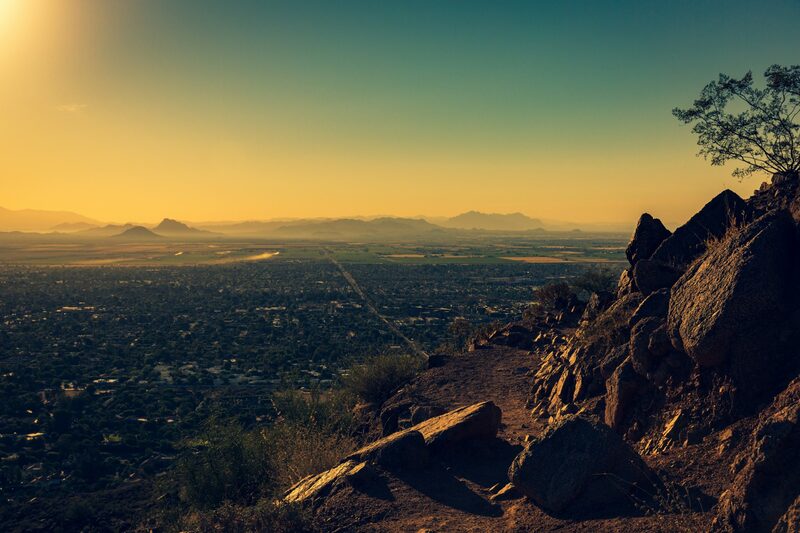 Camelback Mountain – A popular day trip from Phoenix, Camelback Mountain is a great place to go hiking right outside the city, it’s only about a 20 minute drive from downtown Phoenix. There are two difficult trailheads you can tackle that ascend 1,420 feet and give you 360 degree views of Phoenix and its surroundings. Echo Canyon Trail is 1.2 miles out and back and starts at 4925 E McDonald Dr. The Cholla trail is 1.5 miles out and back and starts at 6131 E Cholla Ln. Both trails are steep, involve hand-over-hand climbing at some sections, and are rated extremely difficult. Goat Yoga – If you’re looking for a unique fitness experience that is all kinds of adorable, Phoenix offers goat yoga! Feel goats climb on your back during your yoga poses to add an extra challenge of balance and weight, and you know, a lot of cuteness. Find out more about Goat Yoga here. Desert Botanical Garden – A great place to see just how diverse the desert can be. This 140-acre botanical garden has over 50,000 plants and 379 rare and endangered species. Butterfly Wonderland – The largest butterfly conservatory in the US, at Butterfly Wonderland you can walk amongst 3,000+ colorful butterflies and reptiles. Drury Inn & Suites – Located a little outside the city center (30 min drive), Drury Inn & Suites is a good budget option in Phoenix for those looking for welcoming hospitality and clean and spacious simple rooms. The hotel is pet-friendly and offers a swimming pool, complimentary breakfast, fitness center, and hot tub/jacuzzi. Found Re Phoenix – If you love design-friendly modern hotels, Found Re has a lot to offer. Located in downtown Phoenix, this is arguably one of the most stylish hotels in town. Includes an on-site restaurant, bar, pool, fitness center, comfy beds, and good coffee. Royal Palms Resort & Spa – An ideal spot for those looking for a luxury stay their last night in Phoenix, Royal Palms Resort & Spa has everything you could want and more, including a stunning and serene setting, spa services, soaking tubs, patios, spacious rooms, and a location that’s right at the base of Camelback Mountain. 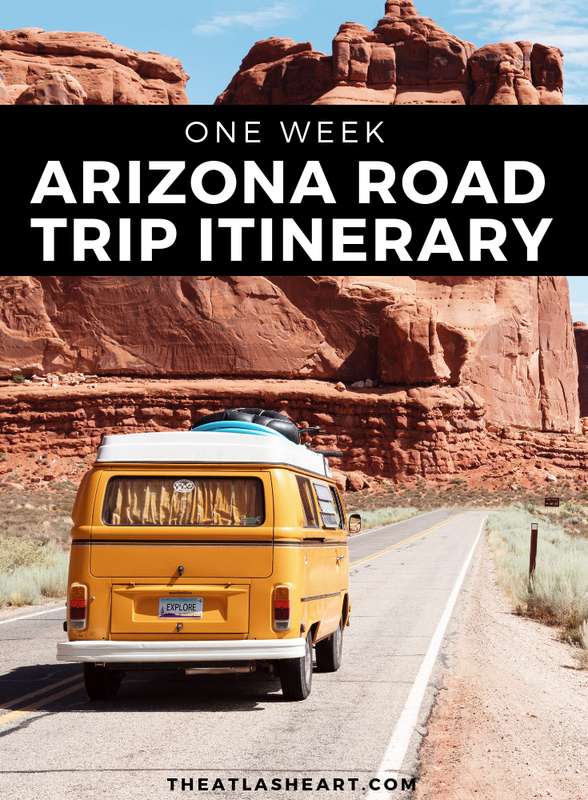 Has this itinerary helped you plan out your upcoming trip to Arizona? I’m confident that Arizona will blow you away as much as it did for me! Buy your Arizona Travel Guide here.